Austin Hemmingson | Daily Press Bay College’s Alfonzo Fields (left) drives to the basket against Alpena Community College’s Tylor Ross (right) during Wednesday’s game at Bay College. Trailing the play for the Norse are Tyler Willete (21) and Kobi Barnes (34). 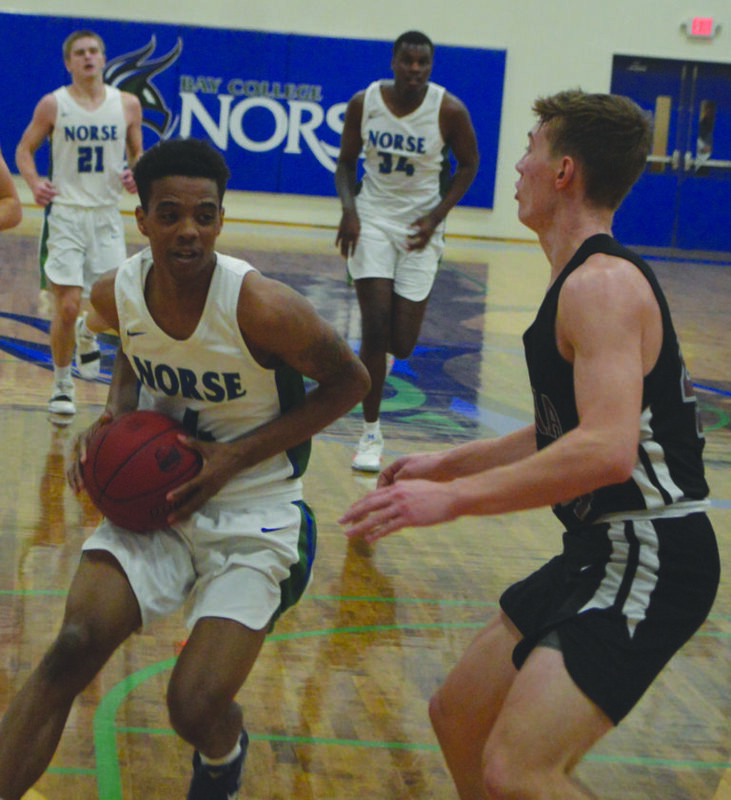 ESCANABA — Bench depth was on full display for the Bay Norse men’s basketball team in a 113-91 victory over Alpena Community College here Wednesday. The Norse had three reserves lead the way in scoring, including Ryan Arndt who hit four three-pointers in the second half to help pull away. 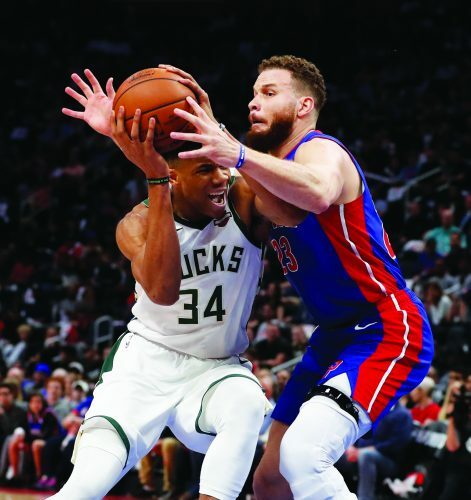 The game was a wild one as both teams found success offensively. The Lumberjacks (0-4) jumped out to a 14-5 lead in the first four minutes. But the Norse responded with a 13-4 run to tie the game at 18 with 13:37 left in the half. After the Norse (7-4) tied the score, the Lumberjacks scored 18 of the next 28 points to go up 36-28 with 8:21 remaining in the half. But the Norse responded again, led by Christian Alexander with a couple of monster dunks in the first half. His lay-up with 3:30 remaining in the half gave the Norse their first lead at 39-38. After the Lumberjacks scored on their next possession, Alexander scored again to put the Norse back ahead and they would never trail again. The Norse closed the half on a 23-6 run to lead 51-42 at the break. They kept up the pace early in the second half, scoring the first four points and kept the Lumberjacks at bay the rest of the way. Logan Guenther hit two free throws with 6:37 left in the game to pull the Lumberjacks within 90-77, but that was the closest they would get. On the next two Norse possessions, Arndt hit triples from the same spot on the left wing to push the lead back to 17. Johnson was complimentary of Alpena after the victory. “That’s a really good team over there,” he said. “Throw records out, Mark (Jacobs) always gets those guys to play hard and they have some really good players. We took a step forward tonight by beating a quality team. Arndt and DeAndre Magsby led the Norse with 16 points. Alexander and Marcus McKenney each scored 13. Alfonzo Fields had 12, while Ryan Robinette and Kobi Barnes each had 10. Guenther led the Lumberjacks with 23 points and 15 rebounds. Tristan Smith added 13 and Cam DeCaire had 12. Garrett Miller chipped in with 11, while Jordan Baker added 10. The Norse visit Milwaukee Harper College Friday. Alpena CC — Guenther 23, Smith 13, DeCaire 12, Miller 11, Baker 10, Rice 9, Hopkins 7, Hogsett 4, Ross 2. F: 21; FT: 13-15; 3-point field goals: Miller 3, DeCaire 2, Hopkins, Rice, Guenther. 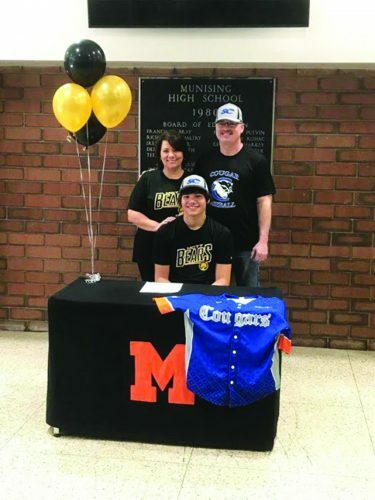 Bay College — Arndt 16, Magsby 16, Alexander 13, McKenney 13, Fields 12, Barnes 10, Robinette 10, Willette 9, Dean 8, Hardwick 5, Mattson 1. F: 14; FT: 17-31; 3-point field goals: Arndt 4, Magsby 2, Dean 2, Fields 2, McKenney 2.